In-home security situations, a wall safe is one of the best user-controlled systems that you can get. You can put all of your valuables, cash, documents, and even firearms away in a safe. Most even mount inside the wall and can easily be concealed. We’ve done the research to bring you the best-rated wall safes on the market right now. Here are some things you should know before we get started. 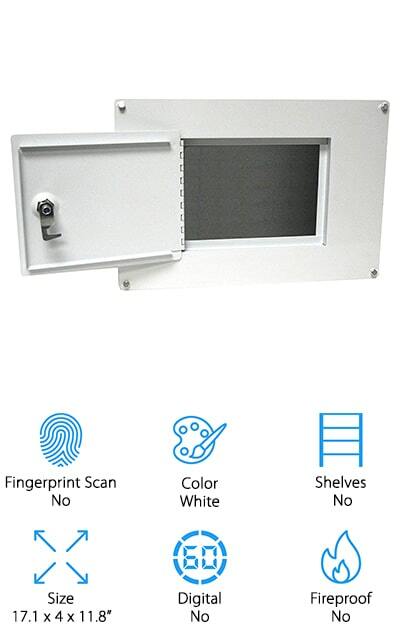 Fingerprint Scan: A fingerprint scan is a customized entry method that allows you access to the stuff inside of your safe simply by placing your finger on the scanner. This is a personalized method that will deny unauthorized access. Color: What color is the safe? It may be easier to conceal a safe that matches the colors of your walls closely than one that is completely opposite. We’ll let you know what color the safe is here. Shelves: Shelves on the inside of the safe can increase the storage capacity and give all of your valuables the space that they need. We’ll let you know if there are any shelves included with the safe. Size: The dimensions of the safe are important, particularly if you are looking to wall-mount it. Knowing the space between your wall studs can help you determine the best place to mount your safe inside your home. Digital: A digital safe usually works on a PIN entry system where you need to input a password to open it. These usually run on batteries and have backup keys in case you get locked out. Fireproof: Fireproof safes are more desirable, especially if you live somewhere that is prone to fires and other tragedies. Getting a fireproof safe can keep your documents secure if tragedy strikes. We’ll let you know about it here. Now we can get into our list of the top ten wall safes. We’ve included a variety of safes, from the simple models to digital entry and fingerprint scanners. We have also tried to include a variety of sizes so that you have the pick when it comes to what will fit in your home. Our top pick and budget pick are highlights, so take a look at those first before moving through the rest of our list. 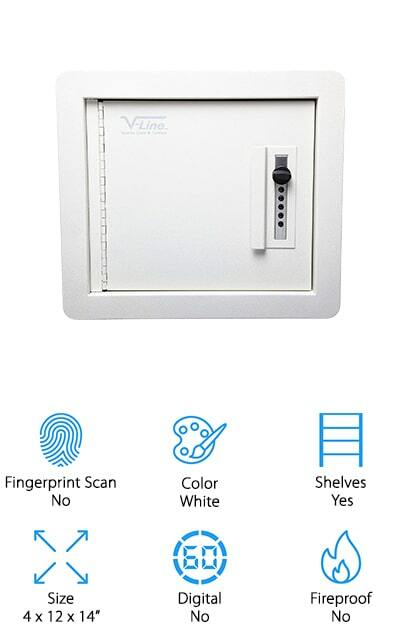 Our pick for one of the top rate wall safes is this one from V-Line. It’s super easy to open with a SIMPLEX lock that doesn’t use any batteries so it will never go dead. While it’s finished off in a beautiful white textured powder coating, it installs flush with the wall, fitting perfectly between the wall studs in your home. You can hide it easily behind a bookcase or mirror, or even a painting! It will look finished with the large flanged edge once it’s set into the wall. It’s simple to install and comes with a fully-adjustable shelf so that you can fit all of your valuables inside. You can also easily set or change the combination on your safe, and there are five different numbers for a possible 1081 different combinations. It’s great for all of your jewelry and small valuables, and the shelf is lined with felt to help keep them safe! 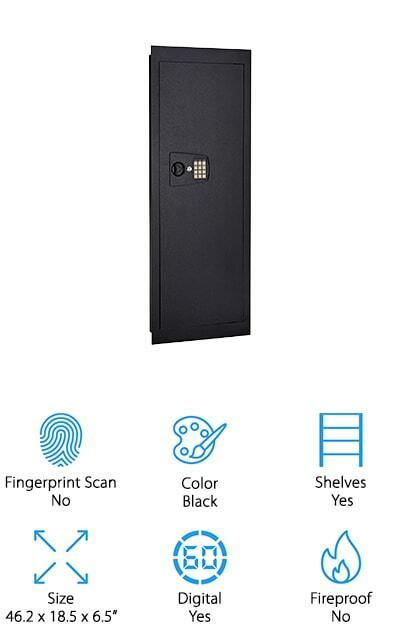 Able’s Digital Wall Safe has a lock that opens on a PIN that you can program to be 3 to 8 digits long, allowing for an almost unlimited number of combinations. There are two inside shelves with felt padding to help keep the most delicate items safe, from jewelry to cash. It includes a master key in case the code is forgotten or lost so that you can always get into your safe. The two keys can also help in the event that the 4 AA batteries that power the lock dies. It’s also one of the best hidden wall safes on our list. It mounts inside the wall and it’s recessed so that you can hide it behind a painting or a mirror for added security. It doesn’t just have a latch, either – there’s a chrome steel pin bolt throw system as well to keep all of your valuables right where you want them. The best biometric wall safe on our list comes from Viking Security. 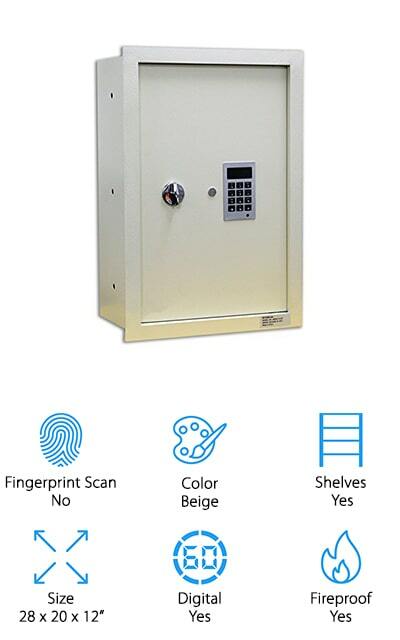 This safe has a fingerprint entry system that’s simple to set up and easy to use. You can save up to 32 different fingerprints so that your entire family can get into the safe if they need to, or a single PIN code. Inside, three shelves are lined with carpet and there is a built-in LED light so you can see all of your valuables even in the dark. You can turn the sound on and off for silent entry, and it’s perfect for keeping your weapons safe until you need them. 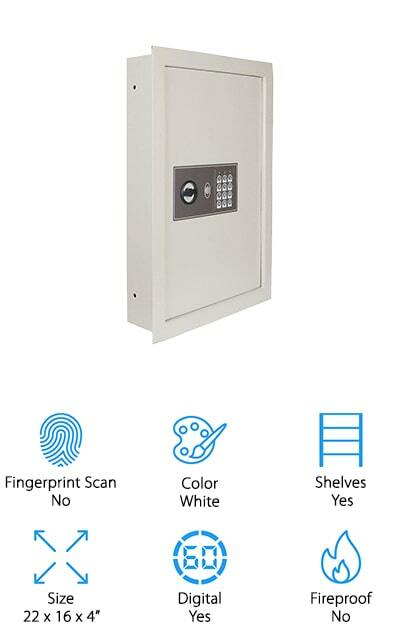 What we like most about this product besides the reliability is the fact that all of the fingerprint data is stored even if the batteries die or get removed. As soon as you change them, you can resume getting into your safe without any issue. It’s a heavy-duty lockbox for all of your important documents! When it comes to residential wall safes, no one really beats Paragon for features and security. 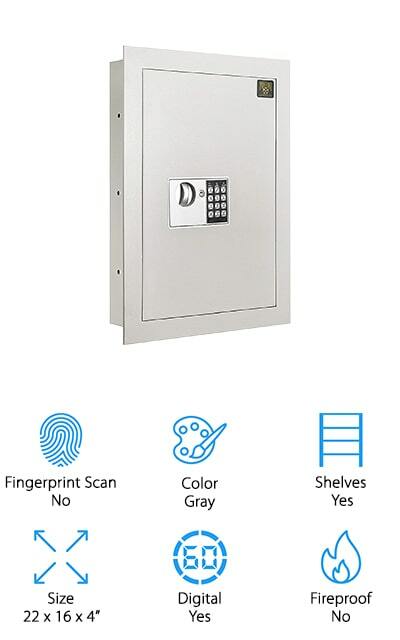 This electronic wall safe can be entered with a code that you can reset indefinitely. It also comes with two keys that you can use to get into the safe if you need to, or in the event that the batteries powering the digital lock die. That's a great failsafe. The hinges are tamper-proof so no one can use them to get into the safe, and it's large enough to store all of your valuables. The entry panel is flat so you can mount it flush to the wall and secure it behind a bookcase or picture. There are pre-drilled holes that allow you to anchor it inside your wall securely. The inside shelves are carpeted so that all of your valuables are protected, too. The PIN that you use to enter the safe can range from 3 to 8 numbers in length. One of the best wall safes for home comes from First Watch. The Homak wall safe is easy to conceal behind a bookcase or inside a closet. It will secure your valuables as well as your firearms and ammunition. This safe doesn’t have any digital components, so it’s perfect for smaller valuables that you want to be protected the old-fashioned way. There are no shelves inside, just one large cavity that you can use to store oddly-shaped things. It uses a tubular locking mechanism that won’t open unless you use the key. It’s constructed of high-quality 1.5mm steel that is extremely safe, and it can fit right between two 16-inch center wall studs for the perfect concealed safe system. It doesn’t fall prey to some of the fallacies of digital systems, including malfunctions or dying batteries. If you want something that is simple and safe, you should go with the First Watch Homak unit. Keep everything safe! On the other hand, we come to a keyless entry digital safe. You can use one of the keys that come with the safe, or you can use the PIN code. You can set the PIN between 3 to 8 digits for different difficulty levels. 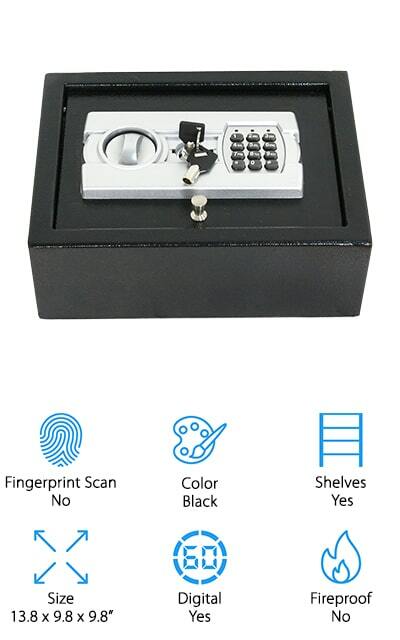 One of the unique things about this safe is a time-out protection feature, which gives better protection after three consecutive incorrect combinations are inputted. You can use this safe for keeping your documents and valuables safe, and even your firearms. There are LED lights and buzzer feedback so that you understand the power and operational status of the safe. It fits flush into the wall so you can conceal it however you see fit. Inside, there are two removable shelves that you can choose to use or not, depending on the size of your valuables. All of the security features make this the best wall safe for jewelry on our list. When it comes to small wall safes for home use, you can’t get much better than the Stack-On In-Wall Pistol Cabinet. There is a removable steel shelf that you can choose to use or not. The bottom of the cabinet and the shelf both have a layer of foam padding to keep everything you put inside safe and secure. It’s marketed as a safe for your guns, ammunition, and firearms, and it’s approved in the state of California as meeting safe firearm standards. However, you don’t have to use it strictly for firearms. It’s also a great safe for different types of valuables, like your cash or jewelry. However, that approval makes this a unique safe on our list. When you are using it to store firearms, it’s great for use with pistols and ammunition. For larger firearms, you should go with a larger version of this safe. You’re going to love it no matter how you use it! 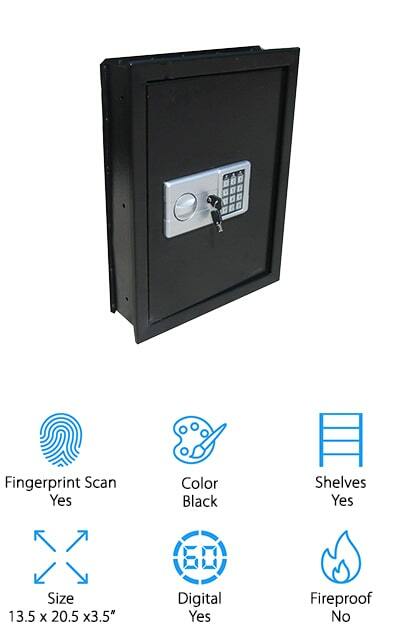 This solid steel electronic safe has a digital entry with a password or PIN and uses four AA batteries to keep that entry system going. It also comes with 2 master keys in the event that you forget the password or it gets changed. When it comes to jewelry wall safes for home use, this one is going to be the sophisticated and secure option for you. Inside, there is an interior shelf for all of your valuables with carpet on every surface to give you extra protection. There are three different symbols that show up on the outside to show you that the safe is locked, unlocked, or if the battery is low so that you have the option to change them. 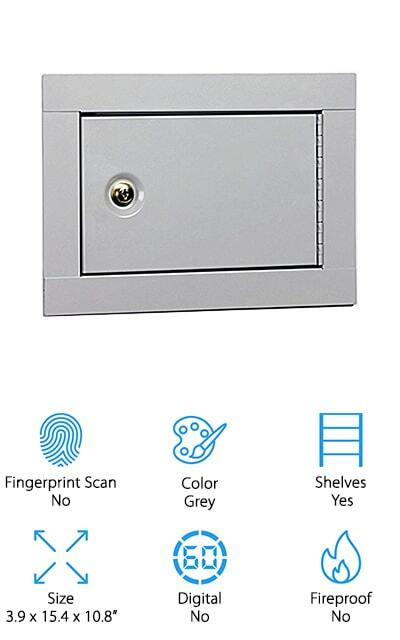 It’s easy to bolt this safe into your wall, and it has enough capacity to fit small and large items with the shelf removed. Even the hinges are concealed, making them pry-resistant! Protex makes the best fireproof wall safe on our list. It has protection against fire for about 30 minutes due to the fire liner velvet interior. There are two shelves that are removable for your convenience, allowing you to fit larger valuables inside the safe. The keypad is flush with the flange on the safe, allowing it to hold flush to the wall and giving you the room to conceal it behind a flat surface. This wall safe is also incredibly deep due to all of the hardware inside, also giving you extra room for valuables. It’s a full 8-inches deep, so it’s going to hold all of the things that you need it to. That means that you might need additional help in installing it, as well. You can also use the override key to open the safe if the PIN is lost. It’s one of the best fireproof wall safes for home use. Last on our list of the best-rated wall safes is this one from Snap Safe. 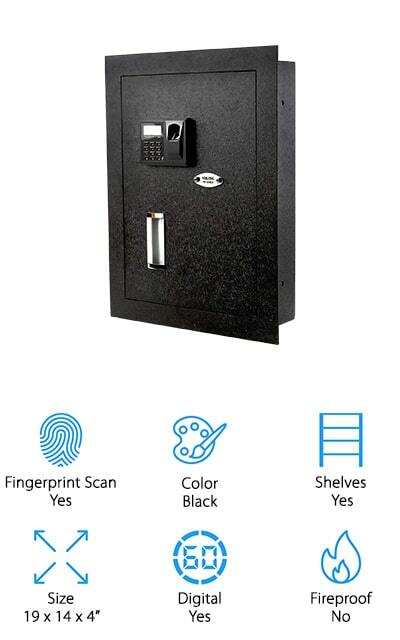 It’s made of 16-gauge steel on the body of the safe and a .15” steel door to make sure that everything inside is always safe. It features electronic entry with a key backup so that you will always be able to get into your safe. To run the electronic entry section, you need batteries that don’t come in the package. There are three removable shelves inside the safe, giving you plenty of room to store all of your documents and valuables. Since this is an in-wall safe, you get the added benefit of being able to hide it behind furniture or pictures so that no one even knows that it’s there. When you want to take charge of your own home security, look into getting a SnapSafe. It’s easy to install and you definitely aren’t going to regret your purchase.